Who can use these Conditions of Sale? What are these Conditions of Sale for? 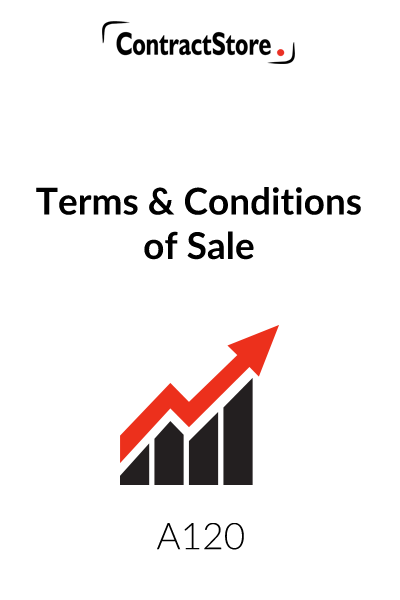 These conditions of sale are in clear English, comprehensive and designed for use whenever your business is making a sale of its products. 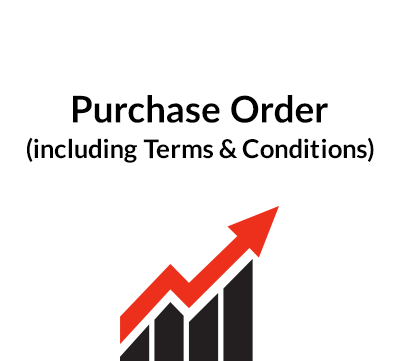 You will get a package of documents consisting of the Conditions of Sale and explanatory notes, plus a duplicate set of Conditions in a one page small print format that you can use on the back of when sending a quotation, confirmation of order or invoice. Terms of sale need to make it clear that they apply whenever the seller makes a sale. Pricing and acceptance of quotations should also be covered, with a time limit for acceptance. Delivery arrangements are important and a seller should avoid a firm commitment to delivery dates if possible – our terms provide for all delivery dates to be estimated only. Incoterms may apply on export sales if there is a letter of credit. Passing of risk and ownership needs to be dealt with. Where the sale involves installation or storage, these should also be covered. Intellectual property protection for the seller is recommended, especially in the case of sales of goods for export. Force majeure is also advisable so that the seller has no liability if some unforeseen event occurs. These Conditions of Sale are “seller-friendly” – i.e. biased in favour of the Seller. The conditions contemplate that the Seller is also a manufacturer. 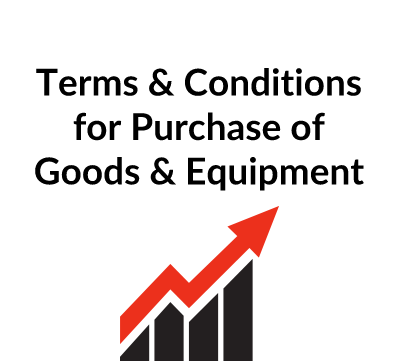 The Conditions are intended as a basis for a manufacturer/supplier to develop a standard set of terms and conditions which would be made available to prospective customers at the first opportunity. Indeed, the form of quotation, sales contract and/or invoice would usually have these conditions printed on the reverse. These are self-explanatory: the name of the Seller will appear in the printed version. Clause 2 is designed to deal with the problem of the ‘battle of the forms’ – where a Seller and a Customer each want to contract on its own terms and conditions, whose terms will prevail? This is a difficult area and there is no perfect solution. Clause 2.1 is intended to make it clear that the Seller’s Conditions are the only ones on which the Seller contracts. In practice, a Seller who wants to ensure that his Conditions of Sale prevail needs to be vigilant and ensure that his staff is vigilant when negotiating contracts. Since negotiation can lead to changes in printed terms and conditions, clause 2.2 makes it clear that any changes must be recorded in writing and signed by a duly authorised representative of the Seller [and the Customer if “and of the Customer” is not deleted]. The basic reference document for prices is the Seller’s published price list. Prices prevailing at the delivery date will apply unless otherwise agreed. As clause 3.2 indicates, different prices may be quoted by the Seller, in which case there is a 30 day validity period. Clause 3.4 raises the question as to whether packaging, insurance and freight are covered by the costs: we assume that this is not the case and that, as stated later, goods will be collected at the Seller’s premises by the Customer unless otherwise agreed or delivery arranged at the Seller’s cost. The wording at Clause 4.1 makes it clear that the Seller is not bound by any particular delivery date. Delivery, under these Conditions, will take place at the Seller’s premises. The Seller will give notice to the Customer when the goods are ready for collection and the Customer will be responsible for arranging collection. If he does not collect within a specified period (clause 4.3 provides for 7 days), the Seller reserves the right to charge for storage. Clause 4.2 also provides for different delivery arrangements to be agreed in the sales contract and a delivery charge added. The final sub-clause requires the Customer to inspect all goods and to notify the Seller of shortages or defects within a tight timetable. Where special terms are not agreed, the Seller will raise an invoice on delivery and the Customer will have 28 days in which to pay. Late payment entitles the Seller to claim interest. Clause 5.3 also entitles the Seller, if payment is not made by the due date, to cancel the contract. This may be helpful in the case of a consistently bad or non-payer with a continuing contract. 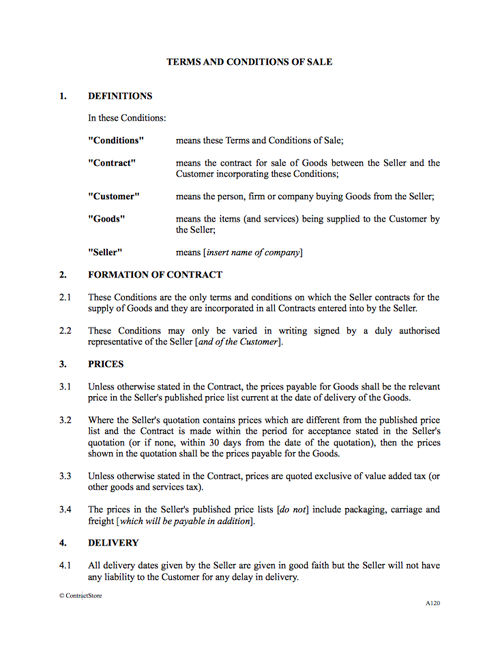 In clause 5.4 provision is made for payment by confirmed letter of credit whenever Goods are sold for export and there is also reference to INCOTERMS which should be reviewed by the Seller to establish the basis of delivery and payment – FOB, CIF etc, may need to be covered in the Conditions or the Quotation. Under English law, ownership in goods and the risk of loss or damage to those goods are separate concepts. What this clause does is to make it clear that until the goods have been paid for in full, they remain the property of the Seller and that gives the Seller the right to recover or re-sell them. Risk, however, passes to the Customer on delivery – or indeed before delivery if the Customer has failed to collect the goods in time. While the wording is intended to protect the Seller, in the event of difficulties – e.g. the Customer becomes insolvent – there may be other contracts entered into which have provisions which compete with these conditions. Legal advice is particularly recommended with regard to such a situation. While this clause may only be appropriate in certain circumstances, it is intended to draw the Customer’s attention to the fact that it has an obligation to follow the manufacturer’s instructions and failure to do so can result in the Seller not being liable for subsequent defects which arise. Also, the clause contains wording which deals with a situation which can arise with some goods, where a Customer asks for advice on installation. As with variations to the Contract, the conditions make it clear that a Customer can only rely on recommendations if they are in writing and signed by an authorised representative of the Seller. This imposes more of a burden on the Seller than the Customer but limits the Customer’s ability to argue that he assumed the salesman giving the recommendation was in fact authorised. For those contracts where such a provision is incorporated, the Seller needs to have an appropriate internal procedure to avoid unauthorised recommendations resulting in warranty claims. Clause 8.2 gives the Customer a  month warranty on Goods. This period may need to be changed. The Seller has the option to remedy defects (by repair or replacement) which appear in goods within the specified period after delivery. The Customer must give immediate notice of any defect and may be required to return the goods for inspection. There are certain exceptions to the Seller’s obligations to remedy defects and these are set out in clause 8.4 and cover such matters as failure to comply with Seller’s instructions, abnormal usage etc. The clause then goes on to exclude various rights which a Customer might otherwise have under the general laws. This is not an easy area and legal advice should be obtained before finalising the Conditions of Sale in this regard, especially where the Customer is a “consumer” (i.e. not a trade customer with equal bargaining power to the Seller) against whom certain rights cannot be excluded. Unforeseen circumstances which cannot be avoided by the Seller are dealt with here. Any obligation on the Seller is, in effect, waived as a result of a force majeure event and the clause also allows the Seller to cancel or suspend the contract in those circumstances. Here the obligation is on the Seller to protect the Customer against any third party which claims an infringement of its patent or some other intellectual property right. It is in the interests of the Seller to conduct any defence of proceedings brought against a Customer and the clause deals with this. This clause imposes a discipline on the parties with regard to the service of notices which arise under the contract – e.g. in relation to delivery or notification of defects. If one party is overseas, reference to airmail should be included. Neither party is entitled to assign its interests to a third party but the Seller is entitled to subcontract (a manufacturer will frequently subcontract work and/or supply or materials). This gives the Seller the right to suspend or cancel a contract in certain circumstances, namely breach of contract, failure to pay and insolvency of the Customer. In addition, if the Seller has reasonable grounds for believing that the Customer is about to commit a breach or, e.g. to become insolvent, it may suspend supply or cancel the Contract. This is a technical legal clause which is designed to avoid the risk of the Conditions becoming null and void because one of those Conditions is held by a court to be illegal. Substantive law governing the interpretation of the contract is specified here – English law is applicable to this Contract in our draft. We have provided here for disputes to be finally resolved by the [English] courts and for both parties to submit to the jurisdiction of those courts. Especially where there is a foreign party, it is advisable to contain a provision which states that that party will submit to the jurisdiction specified in the Contract. For more information on dispute resolution clauses, there are free notes that can be downloaded from our website.